Cloherty chartered surveyors and property management agents brings to market a lovely three bedroom semidetached house located in the desirable Gladesville estate in Castlebar. 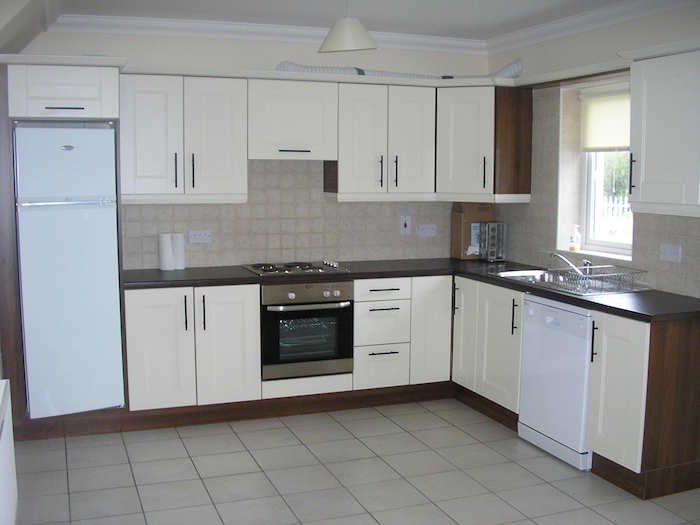 The property would be an ideal starter home or investment opportunity, with huge demand for rental properties of this type in Castlebar at present. The house is located in a quiet cul-de-sac in the estate, making it even more desirable. Given the proximity of the property to both Mayo University Hospital and GMIT it has the potential to yield €11,000 per annum in rental returns. No 24 Gladesville is a very spacious residence with the ground floor comprising entrance hall, kitchen/dining room, sitting room with open fireplace, utility room, and downstairs bathroom. Upstairs are two double bedrooms, with the master bedroom coming with an en suite, a single bedroom, and bathroom. All bedrooms have built-in wardrobes. All bathrooms are fully tiled and fitted with showers and sanitary ware. All appliances are included in sale as are carpets, curtains, and furniture. The property boasts large front and rear gardens and there is a large communal green area located to the front of the house adding to its family friendly location. There is ample parking for two cars at the property and additional parking is available nearby. Contact Cloherty chartered surveyors and property management agents for appointment to view by calling (087 ) 1384822. You can view the property online at www.daft.ie/11485549 Advised minimum value is €179,000.